In the Arabic language, ghaney means the possessor of alot of money, it also means to dispense with people, to do without themand be free from want. When Allah, the Self-SUFFICIENT, suffices someone this means that Allah has enriched him so that he can do without all people and all things, “..this revenge of theirs was their only return for the bounty with which God and His Apostle had enriched them!” (TAWBA, 74), “And He found thee in need, and madethee independent” (DHUHA, 8), “So theyrejected the Message and turned away. But God can do without them”(TAGABUN, 6). 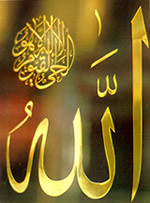 The only real Self-SUFFICIENT is Allah, He says, “Thy Lord is Self-Sufficient, fulll of Mercy”(AN‘AM, 133), “O ye men! It is ye that have needof God; but God is the One Free of all wants, Worthy of all praise” (FATIR, 15). Allah dispenses with everybody and everything; everyoneis in urgent need of Him and His bestowed Grace. It is He Who is neededby everybody, and it is He Who is Self-SUFFICIENT in Himself, His Attributes and in His Divine acts. He, Praise and Glory be to Him, dispenses by Himself, His Names and Attributes with everything; He had been existing while nothing had been with Him, Glory be to the Self-SUFFICIENT, Praise and Glory be to Him, He is Allah.